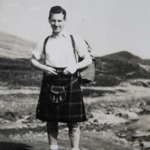 My father, Hamilton Forrest Smith (he was known as Forrest), was born in Glasgow in 1910. Son of James Hamilton Smith, a typesetter on the Glasgow Herald, he had two brothers, Jimmy and Robert and they grew up in Shawlands. He did well at school and joined Yarrows shipyard where he became a naval draughtsman. In the mid 1930s, while staying near Wakefield in Yorkshire, he met my mother, Mabel (also Smith!) on a bicycle trip. They were married in 1939 and settled in Bearsden, Glasgow. He was president of the H.F. in 1942, the year I was born. As a worker in a restricted profession he did not fight in the Second World War but was an air raid warden instead. My mum’s duty was to bake bread in the event of disaster. During his time in the Glasgow H.F., Forrest was in charge of Sunday buses. He told me that he was responsible for a trip one Sunday, immediately after the Clydebank blitz, and the roads were full of bomb craters. As they couldn’t contact anyone to cancel the trip, they went ahead with the bus anyway, and had to just drive round the craters. When the bus arrived at their destination everyone piled out and fell asleep in the countryside as they hadn’t slept for several nights. He was an active member for many decades, leading walks and climbs, and I am delighted to still have his wooden ice axe, complete with leather cover, with his initials engraved on it. My husband (Bill) and I joined the H.F. in 1963 and we were lucky enough to have 4 years of climbing before Alistair was born. We weren’t ‘munro-baggers’ but thoroughly enjoyed all the days and weekends away. In those days there were far more busses organised as fewer people had cars. Many of you may remember John McCulloch (from Saltcoats) brightening up the Sunday bus trips by organising a regular quiz, courtesy of The Sunday Post. 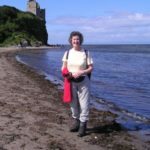 Round this time Margaret Ferguson would organise annual Burn’s suppers in Glasgow, Ayr and Edinburgh in various hotels and members would perform songs and poetry. Another popular H.F. activity were the barbecues. One I remember was at Sallochy Bay, Loch Lomond side. This tradition continues to this day with the barbecues at Mugdock Park, where Alistair is usually the chef. This photo, in the history part of the website, with the 5 sisters in the background, was taken in springtime 1967. I was expecting Alistair at the time and was delighted to be able to get to the Ratagan Youth Hostel. I had heard from Bill what a great place it was and I wasn’t disappointed. 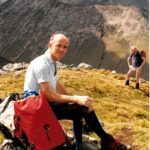 With the arrival of Alistair, our climbing days were curtailed for a while, however we continued to take part in the family walks with all the other parents with young children. The family rambles were very popular and always was good fun. One that we led was in Bridge Of Weir, where we lived, and the children were able to roll their Easter eggs in the local Glen Park before going on the walk. In 1972, H.F. member John Oliver organized a gliding evening at Strathaven. I had two boys at the time and my friend very kindly looked after them for me so that Bill and I could go. The weather was dreadful before and after the event but on the evening it was beautiful, with sun and blue skies. It was a wonderful experience silently gliding through the blue skies. The next time we went youth hostelling was Easter 1978 at Inverary Youth Hostel. By this time I had 3 sons and as they were all over 5 years old we were able to go. We had a lovely German lady, Trudi Galeski in our club and she organized an Easter egg hunt for the children. Alistair was the eldest, won most of the eggs and was most disappointed that they had to be shared out. The club rented a railway cottage on the West Highland Way near Auch, between Tyndrum and Bridge Of Orchy. It had cold running water, an indoor toilet but no electricity. In 1977 our family had a wonderful fortnight’s summer holiday there for the bargain price of £28. The railway ran along the bottom of the garden, and as the trains passed by, the driver would sound his horn and our 3 boys would dash out and wave at the passengers. Just like the railway children. The weather was fantastic and on the Friday the club came down for the Glasgow fair and it started raining. The Glasgow HF has always been such a friendly club. My family has benefited greatly from being members. 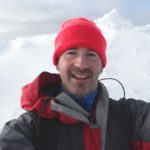 Alistair continues as an active member, leading summer and winter walks and enjoying the company. My family’s three generations have thoroughly enjoyed taking part and hope that the club continues for many more years to come. 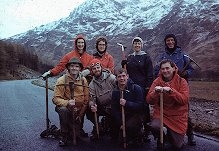 To celebrate this Alistair Wilson will lead a Jubilee Event Second Generation walk of Bill and Pamela Wilson . Misty Law from Loch Winnoch .